The potent immunomodulatory activity of several RP peptides promises to be a useful weapon against many cancers. Cancer is sometimes called "the wound that won't heal;" and in fact, an unfavorable tissue microenvironment is known to be a major factor in the growth and metastasis of solid organ tumors. One particular subclass of the "M2 macrophage" cell type is so frequently associated with tumor development that these are often labeled "tumor-associated macrophages" (TAMs). Administration of certain Riptide drug candidates dramatically lowers the level of tumor-associated macrophages. As a result, the population of tumor-initiating cells (“cancer stem cells”) is greatly reduced, and the growth of existing tumors is halted. Animal models of several organ cancers consistently show significant beneficial results. For example, in the chart shown, triple-negative breast cancer tumors grown in control animals increase in size over 600% during a six-week period. 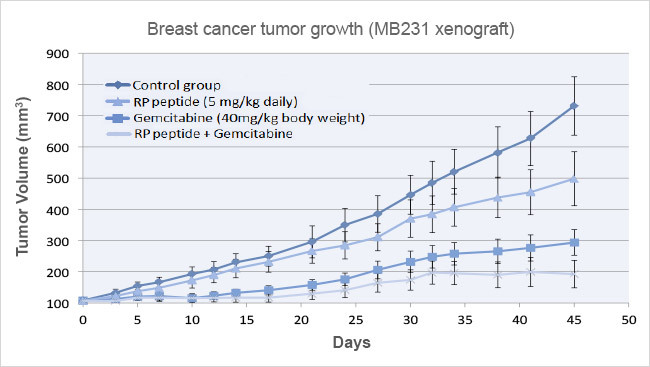 A standard chemotherapy, Gemcitabine, cuts the average growth to 300%. However, adding a Riptide drug candidate to chemotherapy reduces the growth to 200% - and when the concentration is increased, tumor growth essentially stops. The same effect has been shown in models of pancreatic, colon and prostate cancer. Highly promising data supporting the efficacy and safety of Riptide's drug candidates, have been developed by independent researchers at several leading academic institutions and at the National Cancer Institute.